Even though the average life span for a house fly is less than one month, they make very bad house guests. They are known to transfer over 100 disease pathogens which include typhoid, dysentery, cholera and tuberculosis. The small hairs covering house flies serve as their taste organs. These hairs and their legs and mouths spread disease pathogens when feeding on feces, trash and other decaying material. When they are indoors, house flies rest on ceilings, walls, and floors during the day. House flies are attracted to pet food, water sources, and garbage bins indoors, as well as finding a suitable place to lay their eggs. Damp materials indoors such as houseplants are an ideal breeding ground for house flies. House flies are also attracted to manure and decaying food. 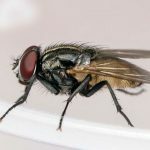 Picking up food particles, covering the trash with a lid and freezing leftovers to reduce the attraction to open food can help eliminate a significant number of house flies.